i’ve been playing a lot of relatively fluffy stuff lately, so i thought i’d buckle down and try to finish off a game i’ve had to return to many times, resident evil on the original playstation (specifically the director’s cut version which features dual shock support, an easy mode, and a rearranged mode (which works much like the zelda series’ second quest), as opposed to the original release). i’d played the much-lauded RE4 ages ago, and although i felt it dragged on i enjoyed it overall. at the time i’d noted that the common knowledge was that that game had gone in a different direction from the previous three entries, so it was interesting to compare the old vs. the new style of RE gameplay. where to begin? first off, the pace of RE1 is much, much slower than RE4. the game’s “tank” controls (whereby you control the character from his POV as opposed to how he’s facing on screen) takes a bit of getting used to, and although i appreciated how this allowed the developers to avoid creating full 3D environments as well as carefully control a variety of camera angles that would heighten the suspense, i never really got to “like” them and found them to be fairly annoying overall. it’s easy to have your character do stupid things like rub up against walls as he/she is running down a corridor, and this really destroyed any sense of immersion for me. a steady barrage of load screens also really slows down the action, and the 3D graphics are blocky, as you’d expect from a fairly early playstation title. 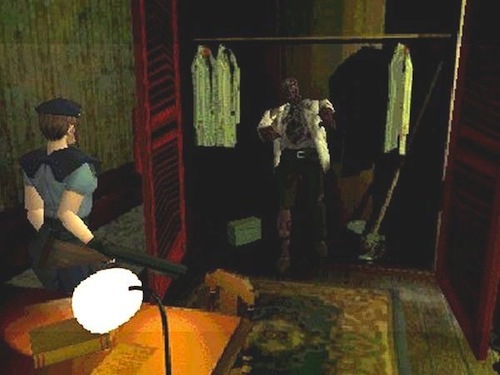 RE1 is also different compared to RE4 in that instead of the linear path of varying environments that RE4 had, the bulk of the game takes place within a single mansion, with new areas opening up in a more metroid-like fashion. the game does alternate sections within the main mansion vs. fairly standalone areas connected to the mansion, so you’re not often running through the exact same corridors over and over again. also, the hazards change anyway, so i didn’t feel like the locations got too boring. i found the game generally tedious for the same reason as RE4, which is that i ended up doing multiple sections of the game twice, once just to explore and figure out what i was supposed to be doing, and once to do it more efficiently and save on ammo. having the ability to save be tied to the survival horror/low resources aspect of the gameplay is also annoying, but i can bring myself to accept it. combat is cumbersome at best and downright obnoxious at worst, and, not knowing any better, i had picked chris instead of jill and thus ended up having to manage a ludicrously small inventory with only six slots. i crept through the game and eventually got to the last section, but by that time i just couldn’t bring myself to spend another two or three hours finishing it. instead i fired up RE2 and played through a few hours of that, and already it feels faster paced: load screens are a lot faster for one thing, and the characters seem to move faster and more smoothly as well. although there were some memorable moments, i didn’t feel particularly “spooked” by the game, and the gameplay def. fell more in the “frustrating” rather than “fun” category for me. i appreciate that RE1 was groundbreaking in many ways, but i’m glad i can finally cross it off my list and explore the rest of the series as well as others in the genre. it will also be interesting to try out its remakes on gamecube and DS. eventually! – the game regularly appears on “top games of all time” lists. it was listed at #28 on 1up’s list from a couple of years ago.